Nothing can beat BetSoft gaming software in terms of the high quality 3D versions of slots. The visual graphics and solid sound effects of BetSoft outstand among the other brands in the gaming industry. Thus, many players are hooked in the slot collections of this well-reputable gaming software provider. Aside from slotmachines, the gaming software company specializes in creating other games too. The BetSoft games are in the market for several years now, and they accept recognitions worldwide. With its huge selections of games, it is quite difficult to pick for the greatest choices. In this game review, we will enumerate and discuss the best BetSoft casino games in the market. One of the reasons why a player chooses a particular game is the offered jackpots. In BetSoft's Treasure Room, gamers can try their luck to ace a progressive jackpot. The 3D Treasure Room lets the user find the treasure in 100 lines to get a perfect combination. This game is considered to be high paying as it has paid €57,072 for a single player's jackpot in the past. Another famous BetSoft machine with impressive jackpot is the Greedy Goblin. Based on its history, this game has rewarded a player with €151,384. If you are lucky enough, you might win an amount higher than this. If not, you can still take home small prizes in a frequent manner. Players will surely get greedy in this game too. For the kind of players who are not after the jackpot, but wanting the higher payout, At the Copa is a great choice. This BetSoft game boasts a Latino ambiance with free spins, stacked wilds, and an overwhelming RTP of 97.5%. This five-reel game can also make a player dance with its bonus round. Other games that can be considered as best BetSoft collections are Good Girl Bad Girl, Safari Sam, The Exterminator, The Glam Life, Jackpot Jamba, Pharaoh King, and many more. 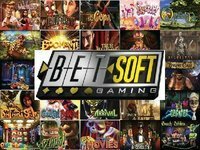 All these best BetSoft games can be played via online without the hassle of downloading any software. If players are still unfamiliar with the games, they can opt to choose the trial mode first. Later on, they can deposit money and let the game face on for real.